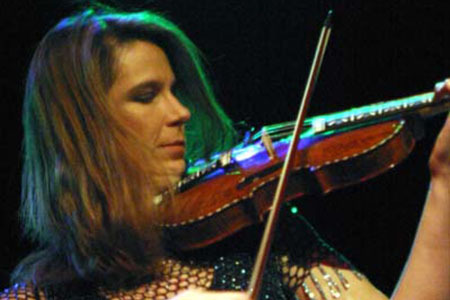 Karen Bentley Pollick gives the Seattle premiere of four new compositions for violin with electronics by Alabama composers a week after their world premiere at the Birmingham Museum of Art. In collaboration with video artist Sheri Wills, Charles Norman Mason‘s Metaman explores the concept of soloist as a visual and aural landscape. Dorothy Hindman fuses live and recorded materials of her earlier compositions composed for Pollick in Fantasia for Karen Alone. Capital Spheres by Michael Angell presents a musical city scape in counterpoint with the voice of the violin. A Girl and Her Dog by Brian Moon weaves samples of Pollick’s hound dog Bobik with live violin. Other compositions on the concert include Sole Injection by Illinois composer Zack Browning, Impossible Animals by Californian David A. Jaffe, Vista by Washington composer Alex Shapiro, and Solo Blues for Violin and Piano by New York based jazz pianist Dan Tepfer.